For most pediatricians and doctors, the winter season is the busiest time of the year. Parents typically report the flu and/or cold as the culprit. Quite often, poor indoor air quality is responsible for prolonged illness, difficulty sleeping, and respiratory discomfort, although it is often overlooked as the cause of these symptoms. With a high efficiency silent HEPA-Air filter, such as the wonderfully designed Airpod by Blueair, you can filter out at least 99.97% of impure airborne particles in your indoor environment, which will in turn improve your family’s health. Compared to air filters with comparable performance rates, the Airpod uses approximately 60% less material in its manufacturing process. The Airpod costs less to run than a single light bulb, and it does not generate ozone byproducts like that of Sharper Image’s Ionic Breeze. Air filtration units used for large areas of space (approx. 200 sq ft-600 sq ft) range anywhere from $150 to $800. It can be quite an investment to purchase such units for every room in your house or apartment. The Airpod allows for good air quality in your smaller personal spaces. The sleek and compact design measures at 6.3″H x 6.3″W x 4.3″D and allows for easy mobility. The unit covers up to 50 square feet and costs $99.95 at most retailers. This is one of the most economical products on the market, especially considering its quality, design and function. 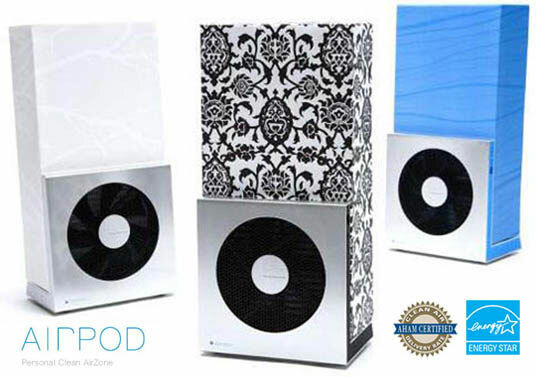 You can find a Graco® HEPA Air Purifier, which covers up to 160 square feet for $59.99, but the Airpod is more aesthetically pleasing, compact and mobile. Parents, take the Airpod to work with you, so that you can filter out those unwanted particles floating in your office air. Sustaining your own good health is just as important as sustaining your child’s. The Airpod is perfect for your child’s playroom/area as well. 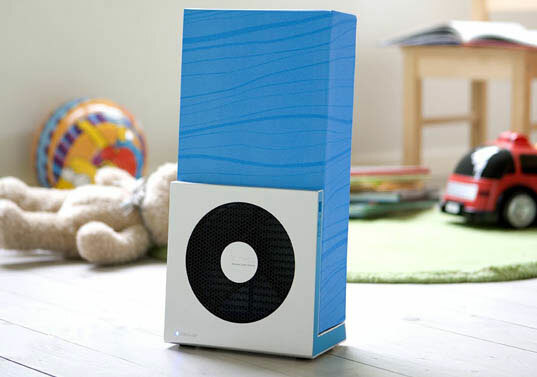 If you are unable to purchase an air filtration unit to cover the entire nursery room, the Airpod can dock next to your baby’s crib while he’s sleeping, and you can easily move it wherever you go to nurse and cuddle with your baby. This looks like a great product! I always feel like I'm coughing and sneezing just inside my house and I think something like this would solve my allergy problems to some extent. I also like the stylish design, especially the black and white. I love the design and the price is pretty competitive. Especially, when you can deliver silense with portability, I think we have a winner here. Just make sure not to overdo it. From what I know, a child needs to get accustomed to all kinds of environmental dangers and filtering the air too much can actually lead to serious allergies later. 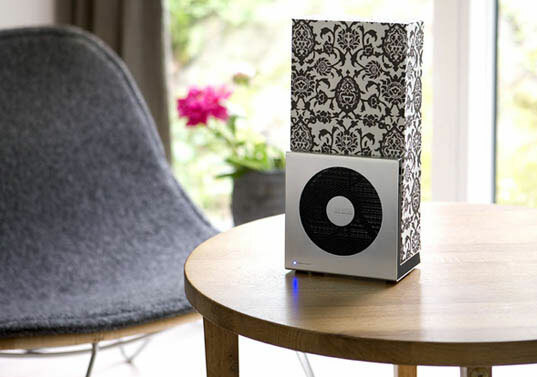 That said, if you actually need an air purifier, this one looks really nice. As i have a bit of a mold problem and dust allergies being enhanced by that, this seems like a great solution. The only problem I see with it is the waste and cost of replacing the filters every 4-6 months =/ up side of that is the replacement filters are encased in cardboard so they are slightly biodegradable. This is actually going for 49.95 on amazon.com and most of the recommendations on there say paying 100$ is too much but 50 is worth it. How is this in any way a good thing for a child? A developing child needs to develop resistance to air-borne particles and bacteria or otherwise develop allergies to such things. I wouldn't have picked inhabitat or even inhabitots to promote a useless consumable that may be harmful to a child in the long-run. For most pediatricians and doctors, the winter season is the busiest time of the year. Parents typically report the flu and/or cold as the culprit. Quite often, poor indoor air quality is responsible for prolonged illness, difficulty sleeping, and respiratory discomfort, although it is often overlooked as the cause of these symptoms. With a high efficiency silent HEPA-Air filter, such as the wonderfully designed Airpod by Blueair, you can filter out at least 99.97% of impure airborne particles in your indoor environment, which will in turn improve your family's health.